An inside source has just give me a sneak peek of the new Dota website. Click the picture above to see the full size. The new website is still on rapid development, so maybe there will be some change on the above design. Anyway, i love the new layout :) What about you? PS: If you haven't know, IceFrog is left Dota-Allstars.com and decide to make a new Dota Website. I highly assume the new site will be launched together with Dota 6.60 on early June. If you ask me, Froggy should really make a permanent logo for DotA Allstars so that he could put it on the loading screen, website, and other DotA related things. I agree, he should make a logo for DotA, the current one (the shield and text) looks good. Maybe he would be using that. And the website looks awesome~! Always loved black! DotA 6.60 beta 54 released! it's already june 1.. hope it'll be released this week. I can't wait men! Even if it's days longer! Too excited! 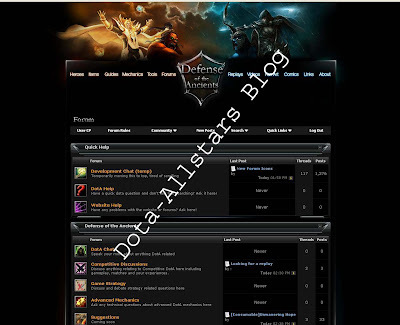 there's already www.dota-allstars.com and www.dota.com (but dota.com is not related to DotA), what's for the new site? NC! there must be the site address! even if it's under maintenance! maybe alief knows the address!!! that drow ranger is always appearing in a picture! In DotA Loading Screen she's always there in all version!WTF!!! "If a feature or change still needs more work, I'll try to save it for the next version instead so I can get this in your hands asap." I think the new feature he's reffering to is the batrider! Batrider can trap enemies into mountains and can Instantly kill at Lvl.16 which is not available. Maybe IceFrog can't find a way to avoid it! i didnt think this is the new skin for DA.com. its so ugly. the only thing looks cool is the banner. the new skin should look like this: http://beta.dota-allstars.com. Awhile ago the skin can be used by users but then the feature was remove as it is still in beta development. The link you mention is for Dota-Allstars.com new design. oh, sorry.. i thought you said its DA.com.. sorry.. btw i didnt like the design..but im sure this skin will be improved later. after the new dota web is open,will this web stop?or still cont?? why should this blog stop? this blog is one of the best blog about dota on the internet. keep it up alief. Yeah here u cn dL beta maps! Updated news! Interesting guides, bugs, Etc. won't you delete or change ur post which contains luna's infinite eclipse bug on 6.59d! 4 ur info, it's not a bug it's a collided map, many heroes are cheated in this collided map, ie. Yurnero infinite omnislash, sk infinite epicenter, etc.! LoL i just remember it bec. Someone used it to me yesterday! He's acting it's a bug haha! collided maps are for wusses. let them play in a tournament or on a legit map and they will appear as babies. When is he gonna release that map... ._. Collided maps only work in old versions of warcraft, so what about stop playing on garena and private realms? I can run collided map in warcraft v1.23 :P so you got false information there dude. The collided map was the reason they made the patch and you guys are still using it. Too bad we can't get our countrymates to upgrade to. Just have to play at another country's room. Icefrog will not release 6.60 when the site launches. Trust me. Yeah! He won't release it when the site launches. Yah aku tau kau tunggu lama map ini but pls comment in english pls n ice frog said it will be released early june...just be patient ok or in indonesian harap sabar..
6.60 is not yet delayed! If he give a date, we will be upset! Well,I'll prefer to think about dual lane ownage combo instead of when 6.60 will *finally* be released..
From the five choice above choose one. Inside comment: Current version that Ice works on is 6.60 RC (release candidate) 1. That one was released yesterday. "Inside comment: Current version that Ice works on is 6.60 RC (release candidate) 1. That one was released yesterday." wtf is that suppossed to mean? early June=1st until 15th June..
Mybe we all have to wait 7 days left in early of June..
Alief, I got something to share with you. What is OMG mode? It is a mode where heroes get random abilities from any heroes. It opens up more posibilities in DotA. Give it a try, you never regret. The map is clean, i tested it. There are some bugs i believe. It is coded by a guy named Bob. Anyway, do you know this map creator site? Pls be patient until then. Yeah, right, like we need to believe you about that date, mister beta 81! I am to busy to create account still that doesnt mean i am mister beta. Just wanted to give u some info. Ps: its the real date guys u need to stop w8ing in the sites it makes u (and us bit less) nervous! oh,so we can just give you sites and you post the nice news? (concerning omg mode)..